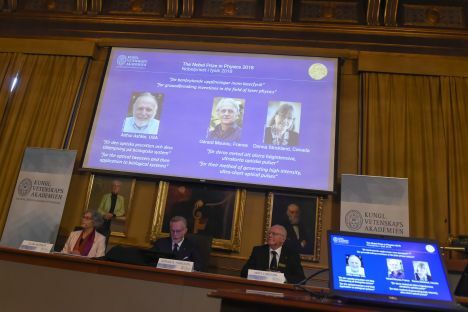 As the laureates of the Nobel Prize in physics on Tuesday, October 2, there have been named laser physicists American Arthur Ashkin and Canadian Donna Strickland, as well as their French colleague Gérard Mourou for their inventions in the 1980s. The Royal Swedish Academy of Sciences announced in Stockholm that one half of the prize would go to Arthur Ashkin «for the optical tweezers and their application to biological systems». Other half of would jointly be awarded to Gérard Mourou and Donna Strickland «for their method of generating high-intensity, ultra-short optical pulses». The total Prize amount is 9 million Swedish krona and equivalent of 866 thousand euros. Please correct this story. Donna Strickland is Canadian!